This was a 40-year old male patient who was brought to the clinic by Correctional Services at the end of 2005. He denied the prior use of ART. He had a CD4 count of 103 cells/ul that rapidly dropped to 64 cells/ul at the time of initiation, and a baseline VL of 390,000 copies/ml. He was clinically well and was initiated on the routine treatment of that time, namely d4T, 3TC, EFV. EFV was switched to NVP due to neuropsychiatric side effects within 3 months and d4T was switched to AZT four months later because of the development of peripheral neuropathy. He was changed to regimen 2 approximately 1 year later. He frequently complained of painful feet and requested letters to the prison authorities to allow him to wear different shoes. The patient had ongoing adherence problems. He was incarcerated throughout and unfortunately passed away in October 2010. This patient never suppressed his VL. In fact, after initiation, his VL actually increased to nearly double the pre-treatment value. Even though the VL did decrease after that, it never reached undetectable levels. The patient CD4 count initially increased on ART but then dropped below pre-treatment values. It never went over 200 cells/ul. His last CD4 count was 6 cells/ul. The genotype was performed approximately six months after treatment was changed to second-line. The VL was 210,000 copies/ml at the time. The patient has a most unusual resistance pattern with only NNRTI (one mutation) and PI resistance (1 minor and 2 major mutations). There is no evidence of any NRTI resistance. At the time of the treatment switch, tenofovir was not yet available in the public sector. There was also no access to new classes of drugs or new generation PIs, such as Darunavir. If I could treat him today, I would recommend a combination of TDF, 3TC and boosted Darunavir. Given the limitations of the time, however, this patient was treated with a triple NRTI combination (AZT, ddI, ABC) and LPV/r. Given the previous history of peripheral neuropathy and ongoing painful feet, it might have been better to drop ddI and rather give AZT and ABC or AZT, ABC and 3TC, in combination with LPV/r. This patient had ongoing adherence problems that were never resolved. Some of the non-adherence could have been driven by the toxicity of the medication. I. Why did the patient VL increase after initiation of treatment? II. How might one explain the absence of NRTI mutations in this patient? III. How many PI mutations are needed for complete resistance to LPV/r? I.  The patient most probably stopped his ART soon after initiation when he developed side effects on EFV. He might have reported this to the clinic doctor, but it was not recorded in the file and probably not addressed satisfactorily until three months later, when the EFV was changed to NVP. II. It is rather difficult to explain how this patient could have PI mutations in the absence of any NRTI mutations. It is possible that the patient was not taking any of the NRTIs since he associated them with his painful feet. He would then be on PI monotherapy and we know that this sets the stage for the development of PI mutations. He did however accumulate the PI mutations very rapidly. It might therefore also be possible that the patient had previous PI exposure that he did not declare, and when he restarted the PI, the archived mutations re-appeared. III. As a rule, a patient needs to accumulate 7 or 8 mutations for complete resistance to LPV/r. PI experienced patients need 6 or more mutations. 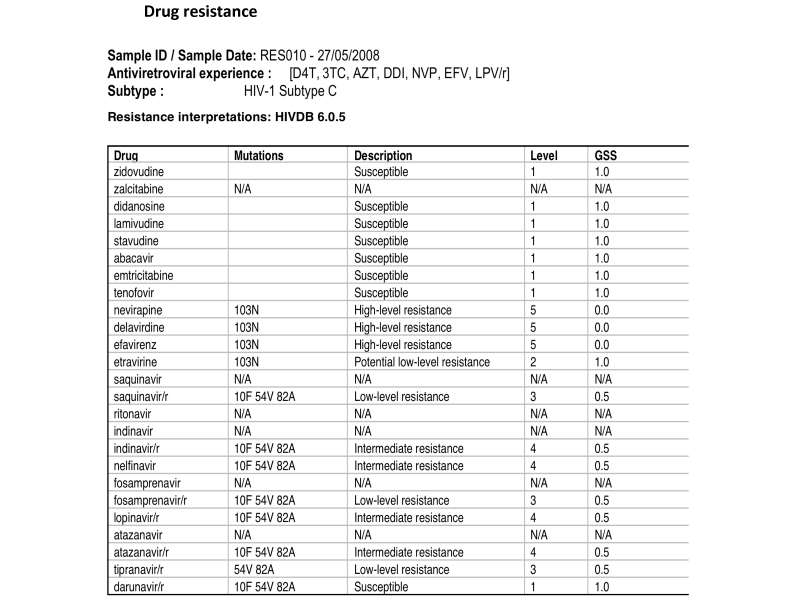 Certain mutations, such as I47A and V32I, are however associated with high-level resistance. I. Always listen to your patient complaints of medication side effects and address these appropriately. II. There is no point in switching to a second line regimen when adherence issues, causing first-line failure, have not been addressed. III. More drugs are not necessarily better, even if the GSS is improved. A balance should be struck between the best possible virological suppression and treatment toxicity. Kantor R, Fessel WJ, Zolopa AR et al. Evolution of Primary Protease Inhibitor Resistance Mutations during Protease Inhibitor Salvage Therapy. Antimicrobial agents and chemotherapy, 2002;46(4):1086-1092.